For courses in technical and pre-engineering technical programs or other programs for which coverage of basic mathematics is required. 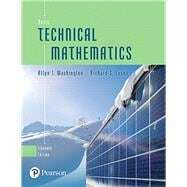 The 11th Edition of Basic Technical Mathematics is a bold revision of this classic best-seller. The text now sports an engaging full-color design, and new co-author Rich Evans has introduced a wealth of relevant applications and improvements, many based on user feedback. The text is supported by an all-new online graphing calculator manual, accessible at point-of-use via short URLs. The MyLab™ Math course features hundreds of new algorithmic exercises, tutorial videos, and PowerPoint slides. The text continues to feature a vast number of applications from technical and pre-engineering fields–including computer design, electronics, solar energy, lasers fiber optics, and the environment–and aims to develop students’ understanding of mathematical methods without simply providing a collection of formulas. The authors start the text by establishing a solid background in algebra and trigonometry, recognizing the importance of these topics for success in solving applied problems. MyLab™ Math is an online homework, tutorial, and assessment program designed to work with this text to engage students and improve results. Within its structured environment, students practice what they learn, test their understanding, and pursue a personalized study plan that helps them absorb course material and understand difficult concepts. The MyLab Math course features hundreds of new algorithmic exercises, tutorial videos, and PowerPoint slides. Allyn J. Washington received his Masters Degree from Brown University, Providence, Rhode Island. Allyn taught mathematics at Trinity College, Hartford, Connecticut, after graduating Phi Beta Kappa from Trinity. He was Professor of Mathematics at Dutchess Community College, Poughkeepsie, New York, where he served as the Mathematics Department Head as well as Dean of the College. Allyn is a founding member of the New York State Mathematics Association of Two Year Colleges and also a founding member of the American Mathematics Association of Two Year Colleges. He was awarded an Honorary Doctorate Degree by State University of New York. He is presently listed in Who's Who in America. The Allyn J. Washington Center for Science and Art Building is named in his honor at Dutchess Community College, Poughkeepsie, New York. Allyn has authored several textbooks in Technical Mathematics for over 50 years, including this edition of Basic Technical Mathematics. Richard Evans received a Master’s Degree in mathematics from Binghamton University in Binghamton, New York. He is currently a professor of mathematics at Corning Community College, where he has taken an active role in the college’s governance system, including having chaired the mathematics department as well as the College Association. He is a long-standing member of the New York Mathematics Association of Two-Year Colleges and has attended and presented at many of these annual conferences. Rich has a strong background in applied mathematics, and has taken two sabbatical leaves involving real-world applications of math in business and industry. In his free time, Rich enjoys spending time with his family, playing guitar, and boating in the Finger Lakes.